So I’ve been trying to decide what to make with some leftover Biscoff spread that has been sitting in my cabinet for a while. This stuff is sooo good. I remember getting those little Biscoff cookies on airplanes when I was little and they actually still gave you snacks on flights. They were so good. When I found out recently that not only do they sell these cookies in grocery stores now, but that they make a spread similar to peanut butter or cookie butter out of the same cookies, I couldn’t wait to get my hands on some. It didn’t disappoint. After I made myself quit eating it by the spoonful, I wasn’t quite sure what else I wanted to do with it, which brings us back to the leftover Biscoff spread in my cabinet. I’ve always loved Puppy Chow/Muddy Buddies, whatever you want to call it. There is something so delicious about the combination of chocolate and peanut butter. I decided that Biscoff spread would probably make for a great substitute for the peanut butter, and while I was at it I figured I’d throw in some Heath Toffee Pieces I had in my cabinet too. 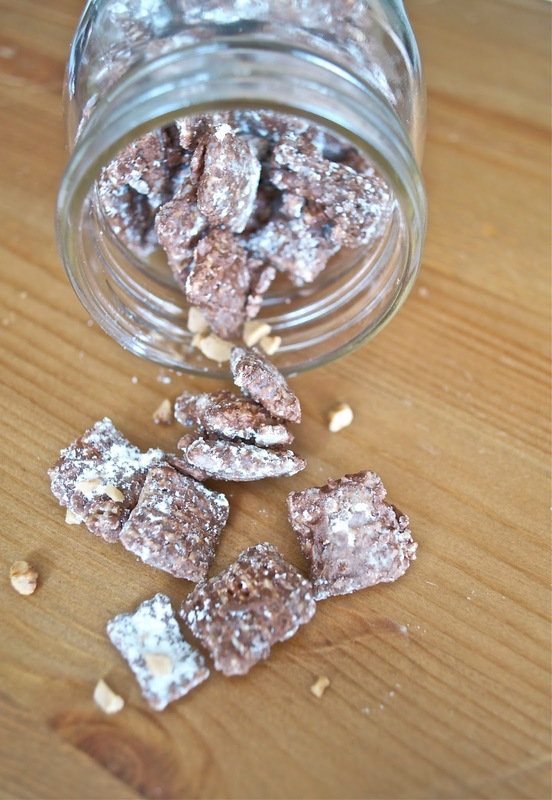 This Toffee Biscoff Puppy Chow turned out delicious and it is so easy to whip up, which is always a good thing. 1. Measure out your 8 cups of cereal and set aside. 2. In a large, microwavable bowl, heat chocolate chips, butter, and Biscoff spread for 1 minute. Mix together until smooth and creamy. Heat for additional increments of 15 seconds if necessary. 3. Gently fold in cereal with a spatula or wooden spoon until it is well coated. 4. Pour in powdered sugar and continue to toss the cereal until it is covered. 5. Refrigerate or serve immediately. Mmmmmmm. I make this a lot, but have never thought about adding the toffee! Great idea! (Here from Naptime Creations) Way to use chocolate, biscoff, and toffee! This just made puppy chow even better! Thanks! These three ingredients are all delicious on their own, so add them together and you can't go wrong! Oh my. This look so good. I just recently fell in love with Biscoff :). I always loved Puppy Chow, but Biscoff just takes it to a whole nother level. Thanks! Biscoff is the best!! It is so good in puppy chow!